Two weeks ago I placed my first ever order to Evan’s and got myself lots of goodies. I was a little worried about the items since I had to do UK/US conversions of size and money, and I didn’t know how much time to anticipate for the arrival of the package. I received the package very quickly, but had a bad cold at the beginning of the week. Finally, after days of moping around the house, I was well enough to head out to town for the day, and I was able to use some of my favorite pieces of the order. The black/oatmeal stripped sweater is really lovely. It is over-sized, so depending on fit you may want to go down a size. I would love to own it in a size down, but I’m also happy with this fit. The line that goes down the front center of the sweater makes the sweater dip from the weight, which gives a lovely effect of bringing in your waist. I especially love the black blocking on the sleeves. 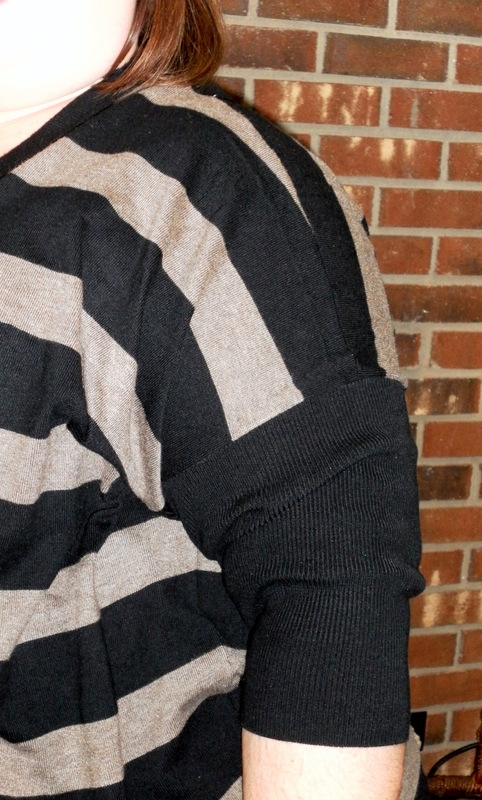 While the sweater is loose and flowy, the sleeves are snug and give it a great look. The sleeves are a bit long for my arms, but I’m only 5’4″, and I feel like I have pretty stubby arms. The sweater is 30% off right now. Here’s the direct link. The bottom is my first pair of true jeggings. The item is no longer available on Evan’s, and I am so glad I got a pair before they sold out! They are very comfortable around my waist. I’ve always been a little fearful of jeggings that had elastic around the waist, because I thought you’d be able to see the band through a top, but these fit well. They were slightly big, but I haven’t washed them yet, so they may shrink up a bit. 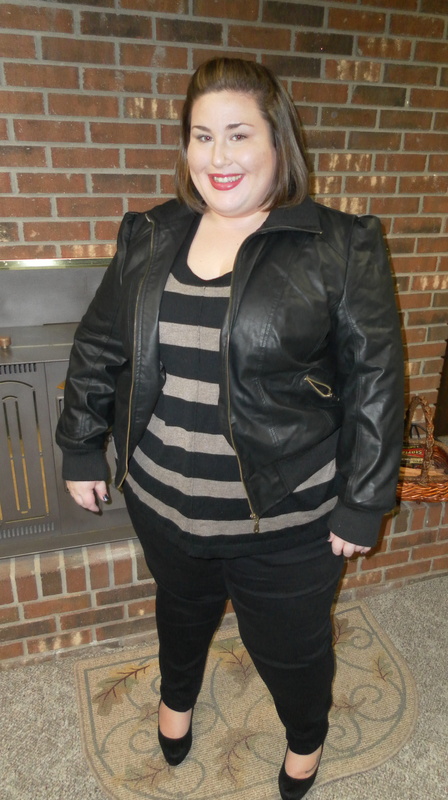 While I wore this around town in flats all day, I quickly went from day to night by putting on my favorite heels and adding my bomber jacket, both from Torrid. 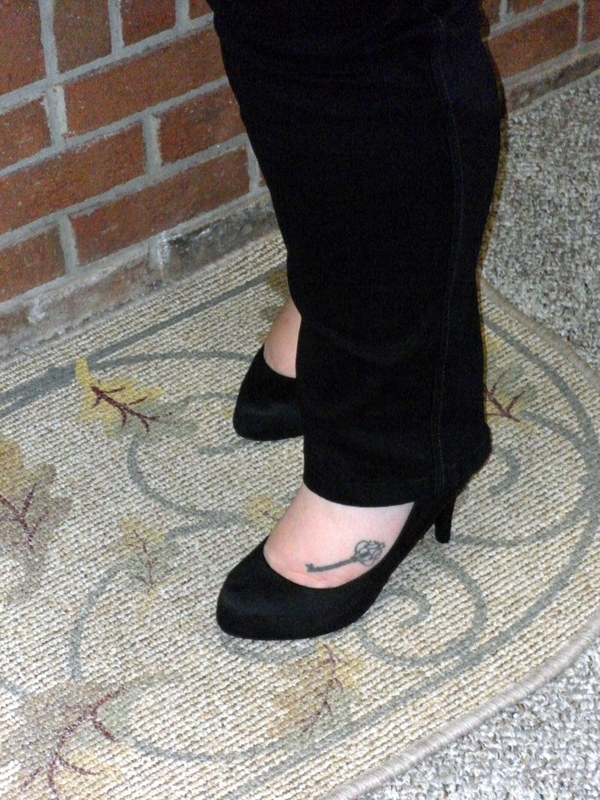 These heels, Royal Black Suede Heel (Wide Width), have been my best buy of the year. Yes, year! I never have been able to wear heels, because it is always so uncomfortable. These beauties are so comfortable to walk in, and I’m a sucker for suede shoes. I have a lot of fun plans to look forward to this weekend. I’m meeting up with one my old roommates from college and another friend of mine that I met in undergrad. We have lots to catch up on and lots of places we want to shop at. I’ve also got to figure out what I want to wear on my date on Sunday. How do you usually pick out date wear? I’m so awful at these things! I really like the day and night look you put together. I seldom even change things out because i hardly get home after work to do a swap of accessories or what’s not before heading out for night again. I just go straight from work! This sweater looks really well on you! That coat is really spectacular! I love it. Love this! I’ve never ordered anything from Evans besides boots…I’m still waiting for a pair acutally. I’ll definitely give some of their tops or dresses a try next time! I love this outfit! This sweater tempted me on my last purchase from Evans but I ended up not buying it. You’re making me regret that! The jacket is amaaaaaaaazing. I can’t find a bomber jacket that fits properly. If they fit, they wont zip up. If it zips up, it is too loose everywhere else!